A number of people have asked if we can provide a way for you to organise your own routes into folders or groups, to make them more manageable. Well, we're pleased to announce today our solution for this - 'Route Tagging', along with a brand new My Routes page, where you can very easily tag and update other details saved with each route and also delete any you no longer need. 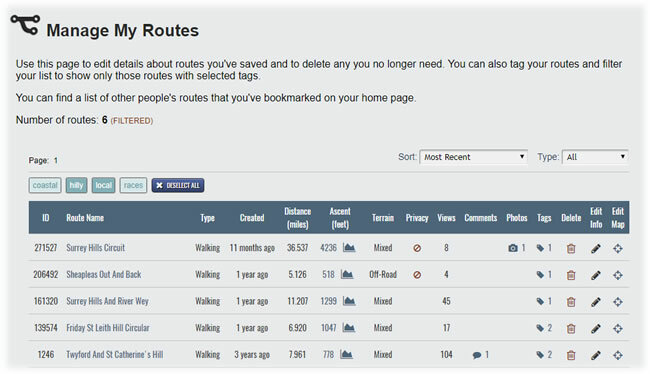 Route tagging enables you to assign your own tags to routes to make them easier to find. For example, you may create the tags "From Home" and "From Work" to enable you to quickly find routes that start from home or your place of work. You can assign more than one tag to a route, so you could for example also add a tag to indicate how hard a route is or perhaps give it your own rating. The choice of tags can be tailored to whatever is most useful for you. And route tags are private, so only you can see the tags you assign to your routes. Once tags have been assigned, you can easily select the routes you are interested in on the My Routes page by selecting the relevant tags. You can access the new My Routes page from the Routes menu. We hope you will find this new feature a useful addition to the site. Thanks Ian :-) It should already offer a list of matching options as you start typing, so I'll check why this isn't working. I'm sure we can sort out the Enter button suggestion. I wasn't able to recreate the problem with tag suggestions not appearing as you type but it should now add new tags when you press the ENTER key after typing the tag name. Thanks for the quick response on this John, ENTER key working fine. Thanks Ian. I've amended this now so that the tag suggestions only match based on the start of the phrase. This is a powerful feature, critical to keep overview in the growing list of routes. 1. unfortunately in Chrome the list of matching options doesn't show up when start typing. Is that a known, and soluble, issue? 2. The tags aren't available in the 'My Routes' view (and filter) on https://www.plotaroute.com/myhome. I hope you're planning to implement is also there? Thanks for the feeback Jasper - glad you like this new feature. Occasionally newly added tags don't instantly show up in the suggestions as you start typing, but we haven't managed to track down why this happens yet, as it's an intermittent problem. Refreshing the page will fix it though. We weren't planning on adding the tag filters to the My Home page I'm afraid - this page is already very complex and the My Routes page is only one click away - but we'll have a think about it as you've raised it.